Price £1300 + VAT per person on our 10 day National General Certificate in Occupational Health and Safety (Units NGC1, GC2 and GC3) excluding examinations. (exam fees extra £115.00 no VAT). This course is either delivered over two block weeks, spead over 1 months, so less time away from the workplace and more opportunity to study. Searching the internet for a NEBOSH Certificate course can be a daunting and time consuming task. There are lots of NEBOSH providers to choose from and a wide range of prices, that is, if you can find a price! Many course provider websites don't even advertise a price and it's difficult to see exactly what you are getting for your money! So what makes our NEBOSH courses different? and why should you book your NEBOSH National General certificate course with us? PRICE: Our price is exceptional value for money. Most NEBOSH Certificate course prices advertised on the internet are between £1200 and £1600 or more! If you see a course advertised at our price, please check to see if they offer the benefits of our NEBOSH course. With our price, you get far more than what you pay for! EASY PAYMENT TERMS: A small deposit is required to secure your NEBOSH course place and the remainder can be paid just before your course start date. We take all forms of payment and will even consider discounting our already awesome price for multiple bookings. COURSE QUALITY: Please be absolutely assured that although our price is lower than other NEBOSH course providers, quality is not compromised in any way. We have considered every aspect of our course and no expense has been spared in providing the best possible learning experience for our students. You will not find a higher quality NEBOSH course available anywhere in the world. 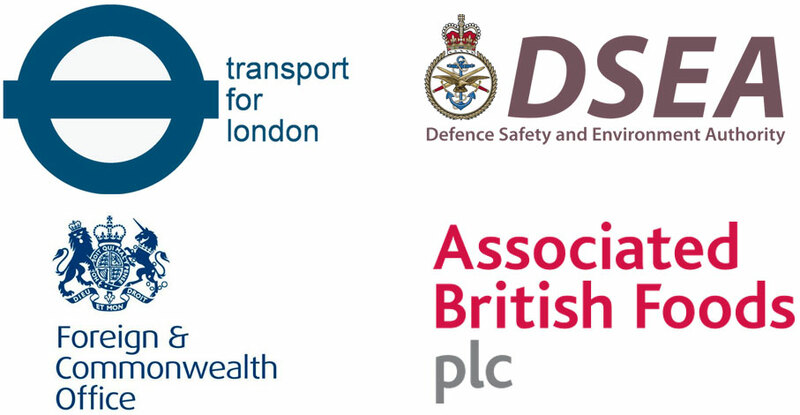 OUR REPUTATION: We are a well respected NEBOSH course provider, our courses are used by many of the world's largest companies, such as the United Kingdom Foreign and Commonwealth Office, Transport for London, The Royal Navy and Associated British Foods to name but a few. Our large Clients invest thousands of pounds in employee NEBOSH training and they need absolute assurance that their staff will pass the course. Failures can lower moral, cause workplace disruptions and entail additional costs in terms of revision and re-sits. We regularly deliver 'in company' NEBOSH courses, which can offer big savings to a company looking to train a large group of staff. Count on our reputation, if you need further assurance, please contact us or see our testimonials page here. EXCEPTIONAL TUTORS: All of our Tutors are highly qualified and practicing Chartered Safety and Health Practitioners with up-to-date worldwide experience of implementing health and safety management systems. Being taught by an expert consultant with real-time varied experience will help you gain a practical understanding of health and safety, which is just as important as passing the course. FACE TO FACE LEARNING: Our course is a taught course, you are face to face with an expert tutor, so you can ask questions and gain feedback and increase your chances of passing the course. You will also benefit from being with a group of people from a wide variety of backgrounds and industries, and many people make good business contacts attending the course. BLOCK DELIVERY METHOD: Our NEBOSH Certificate course is ran over two weeks with the exams taking place at the end of the course. It is possible to find providers who will offer a day release method. But it takes longer to gain the qualification, and the information from the first day of the course can fade by exam day. Our two week block course is a very effective method of delivery and will give you the best possible chance of passing the course. If you are considering using the NEBOSH Certificate to embark on a new career, our two week block course will enable you to achieve the qualification quickly, so you can more rapidly advance your career. PASS-RATE: Our NEBOSH course pass-rate is exceptional, you can rest assured that you are in safe hands. We are always developing new ideas and techniques to improve our course. It also doesn't matter what age you are, or what level of experience you have or existing qualifications. We have had people gain Distinctions that haven't sat in a classroom for over 30 years! 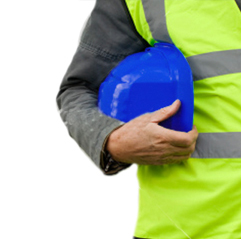 We have had people of all ages from 17 - 63 years old on our NEBOSH courses! so the course is suitable for any age group. GRADE RATE: Although a pass grade is all that really matters. It is possible to gain Credits and Distinctions in the NEBOSH Certificate examinations. Most of our students pass with a high grade and we regularly have training groups gaining Distinctions and Credits. We have achieved a record breaking 13 Distinctions grades on one course alone! 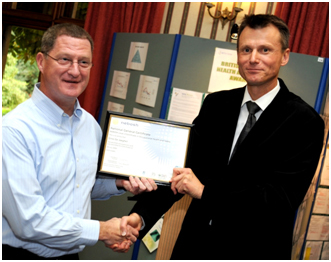 AWARD WINNING TRAINING: We won an award from British Sugar plc for the quality of the NEBOSH training and the effect it has had in improving safety culture and reducing workplace accidents across their UK sugar factories. We have trained over 200 British Sugar employees, including the Managing Director and most of their UK board of Directors! The picture above shows British Sugar UK, Managing Director Gino De Jaegher (left) who was trained by Phil Douglas of Oracle Safety Associates Limited receiving his NEBOSH National General Certificate from Trevor Smith, British Sugar UK’s Head of Operations. See the NEBOSH Website for further details. SMALL STUDENT GROUPS: We have small groups to facilitate learning and interaction, usually a limit of 12 persons. Some course providers have very large groups, and that can have an effect on the quality of the course and the examination results. COURSE DOCUMENTATION: As well as our own well prepared and focussed handouts, we also include in the course price, the latest version of the Introduction to Health and Safety at Work, 6th Edition By Phil Hughes and Ed Ferrett. 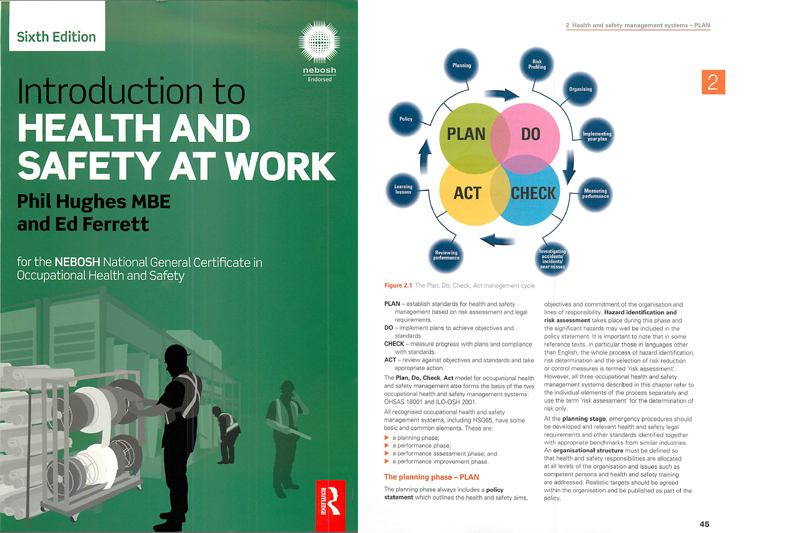 This great NEBOSH Certificate textbook will introduce you to the fundamentals of health and safety in the workplace and help you study for the examination. It's also a great ready reference for day to day health and safety issues after the course. This book retails at £46.99 and is endorsed by NEBOSH! We have reviewed it and think it's a great book, and are happy to offer a free copy to our NEBOSH Certificate students which will be presented on the first day of the course. As well books and handouts, we provide everything you will need to undertake the NEBOSH Cerificate course, including folders, pens and stationary, Just bring yourself and your enthusiasm to the course, we'll do the rest! FREE WIFI: Every room at our venue has wireless internet, so keeping up to date with work and home using laptops and smart phones is easy. The venue has Apple compatible conferencing and presentation facilities throughout so we benefit from “Air Play” and WiFi connectivity and it's literally in the palms of our hands! CAREER ADVICE: We also realise that many people attend our courses having been made redundant or are people who are looking for a new career direction and see health and safety as a big opportunity. We understand that it can be difficult to break into a new career and offer assistance in preparing CV's and job search techniques and in some cases good business contacts. Our consultants travel the world and work in such places as Saudi Arabia and Kazakhstan and can give good advice on how to progress a lucrative career in the oil and petrochemical and other high risk industry sectors. If you want to be a Manager or embark on a Safety career in a high risk industry, you will need a NEBOSH Certificate National General Certificate! Surveys have indicated that the average salary of a NEBOSH Certificate holder is around £30,000 per year in the UK. Abroad you can earn much more, and many go on to do so. Many oil companies send us their staff to be trained, they place their trust in us, so you can too! If you thinking of a career in health and safety, a NEBOSH Certificate is almost essential. NEBOSH carried out a survey, between 20th February and 19th March 2013 and found that a NEBOSH health and safety qualification is specified in nearly three-quarters of job advertisements! Overall, 74% of positions mentioned at least one NEBOSH health and safety qualification, up from 72% last year. A NEBOSH Diploma was specified in 39 cases and a NEBOSH Certificate level qualification 40 times. Membership of IOSH (The Institution of Occupational Safety and Health) at Technician level or higher was mentioned in 39% of job adverts. IOSH membership at Technician, Graduate or Chartered levels require accredited qualifications such as those offered by NEBOSH. The average top-end salary advertised was £46,000 per annum, up slightly from £44,000 last year. More than half (52%) of the vacancies were in London and the South East, with 15% in the Midlands and the remainder spread throughout the UK. A NEBOSH National General Certificate can entitles you to Technician Membership (Tech IOSH) of IOSH (the Institution of Occupational Safety and Health) and Associate Membership (AIIRSM) of the International Institute of Risk and Safety Management (IIRSM). These memberships allow you to display the impressive designatory letters Tech IOSH or AIIRSM after you name! ELCAS - We are also an accredited and approved learning provider for the MoD's Enhanced Learning Credits Scheme (ELC). The ELC scheme provides financial support in the form of a single up-front payment in each of a maximum of three separate financial years. All of our NEBOSH courses are available for funding under the scheme. We have many years experience of training past and present armed forces personnel and can offer some good advice for armed forces personnel on using a NEBOSH qualification in "civvy street". The NEBOSH National General Certificate course is a globally recognised qualification in health & safety. It provides an overview of the key aspects of health and safety such as law, risk assessment, the management of health and safety and the identification and control of workplace hazards and develops a 'safety culture' in the workplace. The aim is to enable delegates to build on their existing knowledge and experience by learning how to identify and manage hazards in any work environment. On completion of the NEBOSH course delegates will be able to identify health and safety issues and know how to deal with them in a professional way, in line with legal requirements and best practice. The NEBOSH National General Certificate is aimed at anyone who has an interest in health and safety. Managers and Supervisors with specific responsibility for managing and coordinating health and safety in the workplace, newly appointed Safety Advisers can also benefit. The NEBOSH Certificate course is the first stepping stone to higher level training, such as Degrees and Diplomas. There are no formal entry requirements to the NEBOSH National General Certificate but it should be noted that the examination includes a requirement to write a short report. We can provide guidance on materials to read before the NEBOSH course and discuss the content with you, however many people attend our NEBOSH courses without a detailed knowledge of health and safety. Enthusiasm and a willingness to work hard are as important as any prior knowledge. Identify common workplace hazards and unsafe practices. Advice on appropriate preventative and protective measures and strategies needed to control risk. Monitor management policies, procedures and performance in ensuring health and safety in the workplace. 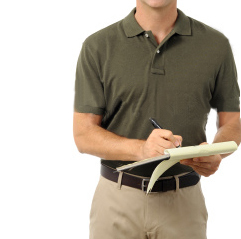 Investigate accidents and undertake workplace inspections. 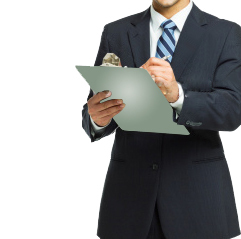 Identify the requirement of health and safety legislation. Specify health and safety training needs.